Have you ever had a filter produce output that bewildered you and you weren’t sure how that output was being generated? I’d like to show you how using Xdebug can make that job a little easier. Sure, you can search your codebase for functions that modify the filter. That’s certainly one way to solve the problem. Another is to leverage Xdebug’s ability to step through an application and see what’s loaded and how inputs are modified. By setting breakpoints at specific portions of the code, we’re able to see how a filter is being applied as well as which functions are modifying the input. For instance: let’s say our post permalinks are being modified and we’re not sure why or what exactly is doing the modifications. Xdebug allows us to gain a deeper visibility into the code! As we’re not sure which function is modifying the permalink, we insert a Breakpoint at the very beginning of the filter chain processing the post_link filter by setting priority 0. If you wanted, you could even add it as a negative number in the event there are filters registered at priority 0. It’s important to return $permalink because otherwise, the filters further down the chain wouldn’t have anything to filter! This will land you on line 275 of wp-includes/class-wp-filter, which at the time of this writing is WordPress 4.9.7. Now that you’re within the apply_filters function, you can step through each of the functions that are registered to the post_link filter (those functions are called via the calls to call_user_func_array here). If I lost you at the point where I said "Xdebug configured properly," then don’t worry, we have you covered. We have a series covering Xdebug and configuring properly! If you’re interested in learning more about how to configure it for your development environment, how to use it with an IDE, or how to connect to a remote environment, check out our screencast series Debugging PHP with Xdebug: Beyond var_dump. We cover how to install and configure Xdebug with MAMP, Valet, and Trellis, as well as how to use Xdebug with Visual Studio Code and PHPStorm. Happy debugging! 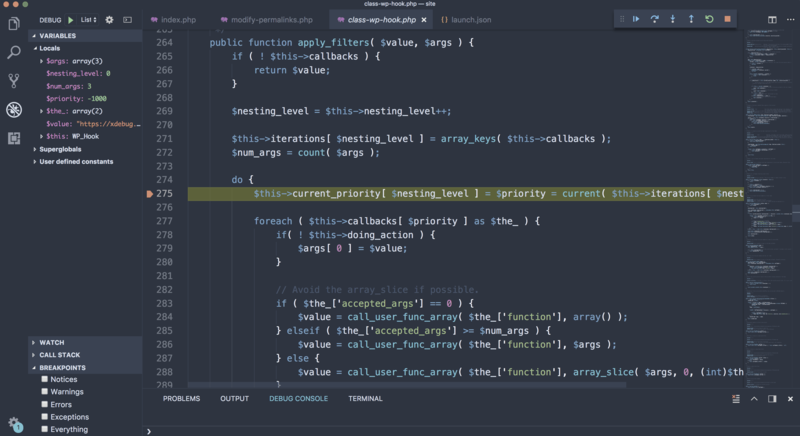 Choosing a Debugger/IDE: PHPStorm, VS Code, Sublime Text, or Vim?